People come to discover fermented foods either because of the health benefits associated with eating them or simply because they love the taste. 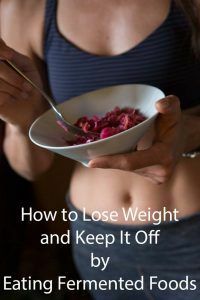 One thing many people don’t know is that eating fermented foods can lead to weight loss and help to keep off those extra pounds. 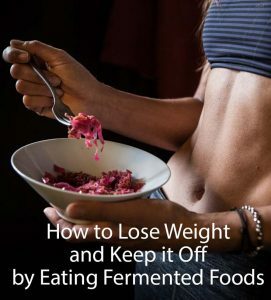 I’ve scoured through much published research and there is some good evidence pointing toward the consumption of fermented foods in helping to control weight. When I recommend fermented foods, I’m mostly speaking of fermented vegetables. While there are health benefits to eating yogurt and kefir, consuming the underlying dairy substrate is generally counterproductive. Eating fermented vegetables provides many nutrients and fiber which is helpful in weightloss. At some point in the future, I’ll write more about “pre-biotics” as opposed to “pro-biotics,” but for now, suffice it to say that feeding the healthy micro-organisms in our gut is essential in stabilizing a balance of healthy digestive microbes in our digestive tract. Eating cabbage and other underlying vegetables commonly used in fermentation is also providing additional “pre-biotic” food for our digestive system companions. There is an immense amount of institutional research going on these days on the bacteria in the gut and its relationship to human health. Current research shows that the bacterial makeup of the digestive system of normal weight people is quite different from that of obese people (1). Some animal research has also shown that when gut bacteria from obese mice is transplanted into the gut of lean mice, that the lean mice gain weight. (2) This doesn’t show a specific food to eat, but the more we can move towards having a diverse and optimally functioning digestive system, the more likely it is that we can live at a healthier weight. A double blind study among obese people in Japan showed that ingesting two Tablespoons of apple cIder vinegar a day led to weight loss. The loss wasn’t monolithic, but the average person consuming the vinegar (while otherwise eating their normal diet) lost four pounds of visceral (belly) fat, while those in the control group actually gained weight. (3) The ingredient which led to the weightloss was the Acetic Acid component of the vinegar which is a common component of fermented foods. It is understood that the acetic acid slows the digestion and absorption of starches, helping to prevent spikes in blood sugar and thus helping to prevent the conversion of carbohydrates to fat for storage. Experiments have shown that people eat the same amount of food by volume, irrespective of calories consumed. (4) Thus, when we eat high water content, nutrient dense prebiotic fiber containing foods such as fermented foods, not only do we get excellent nutritive value from our food, but we end up eating fewer calories and we feel satisfied in doing so. I love eating salads like this kale curtido salad, where I toss a salad but mix in a fermented food such as curtido or sauerkraut. Much as eating an apple is a great way to snack because it has few calories for its volume, fermented vegetables can help to fill you up but not weigh you down. In another study, the consumption of Lactobacillus gasseri, added to fermented milk, led to a reduction in abdominal visceral fat by 8.5%. (6) As in the acetic acid study mentioned earlier, weight returned once consumption halted. To me, that is simply further confirmation of the weight loss findings of the study. Lactobacillis gasseri can be ingested in your diet if you eat sauerkraut, kimchi, natto, miso, kefir and tempeh. Much like an automobile burns fuel more efficiently when it is properly tuned, our bodies digest foods and assimilate nutrients more efficiently and effectively when our digestive tract is operating well. The best thing for optimal digestion is having a gut with a healthy balance of microbes. I’ve been on a vegetarian (mostly vegan) diet for nearly a decade now and am a big advocate for consuming a whole foods plant-based diet. When we eat a whole food (not processed), plant-based diet which includes nuts, seeds, grains, legumes, fruits, vegetables, and healthy fats, it becomes very difficult to not stay more slender. With this nutritional lifestyle there simply aren’t a lot of calorie-dense options and we end up feeling satisfied by naturally eating high-fiber, nutrient-dense, low caloric food. And contrary to popular belief, it’s very easy to get more than enough protein when we eat this way. From a health perspective, scientific research has shown that just about every disease we commonly find in the western world including our biggest killer coronary artery disease can be prevented or reversed by eating a whole foods, plant-based diet. I’ve been a fan of Dr. Michael Greger and his site Nutition Facts for awhile now and have been enjoying his new book: “How Not to Die” which I highly recommend (the book and not dying!). I encourage you to check it out. Ted, what about all the salt that is used in fermentation? We already have too much salt in our diets. Personally I don’t eat much processed food and chips nor do I add salt to my cooking so having salt in my fermented foods isn’t a big concern to me. Cutting out the unhealthy salted foods is always recommended. I’ve been experimenting more with adding less salt to my ferments too as I’d prefer less salty flavor in some, and I’d like to be able to recommend less salt in my recipes. Some folks add whey to their ferments to jumpstart and more quickly stabilize the fermentation process and thus successfully use less salt. Good luck!